When we sign a lease we expect the premises to be kept healthy and habitable. One of the most serious problems that can cause inhabitability in a rental property is a bed bug infestation. Bed bugs can become a serious problem because they multiply so quickly. They are easily transmitted, so an entire apartment building may become infected. Property managers must properly respond to bed bug reports, and work to eliminate the problem. Failure to do so is illegal. Bed bugs are tiny, brown or reddish-colored insects without wings. They feed mostly on blood from animals or people. Bed bugs come out mostly at night. Because of their small size, they often hide between small cracks or crevices in bedding, carpeting, mattresses, couches, and other areas. Female bed bugs lay thousands of eggs over their lifetimes. Each egg is only about the size of a speck of dust. Bed bugs can easily hide in suitcases, furniture, and similar items so they can be easily transported between locations. Bed bugs may go undetected for a while because they are difficult to see. One of the first signs of a bed bug infestation is the presence of bites. These little insects can crawl onto your skin at night and bite. The bite marks are usually tiny red marks that may be itchy. Some people may think they have mosquito bites. Although they do not transmit diseases, bed bug bites can be very annoying. 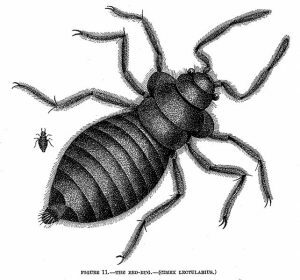 Bed bugs will bite any uncovered skin areas and will continue to bite until the infestation is removed. Bed bugs are so small that they are hard to see, especially because they are most active at night. If you think you may have bed bugs, there are several things to check for. Look at your bedding to see if you notice small blood marks. You may also see red or brown marks on the sheets and mattress, or on the walls. Bed bugs shed their skin, so you may find a number of skins or shells. Pull up the mattress and box springs to inspect them closely. Look in areas near the frame corners, or where there are seams. Bed bugs can also hide in other parts of the apartment. With a large infestation, you may find bed bugs inside books, under carpets, behind switch plates, on curtains, and inside of clocks or radios. They may also be hiding in closets, clothing, purses, and shoes. As a tenant, you should immediately report the bed bug infestation to your landlord. The property owner or manager is responsible for taking steps to eradicate the problem. Be sure to document the report through an email or letter. In San Francisco, property owners are required to resolve problems of habitability, such as bed bug infestations, in a timely manner. The failure to do so is in violation of the San Francisco Health Code and California Housing Code. You may file a complaint with the San Francisco Department of Public Health. If your apartment or rental unit is infested with bed bugs, you may need to take legal action. Contact the experienced lawyers at Brod Law Firm to discuss your case. Call today at 800-427-7020 for a consultation.